Intel has published few days ago a new graphics driver (v10.18.10.3960) for its GPUs (4th Generation Intel Core Processors with Intel HD graphics, Intel Iris™graphics and Intel Iris Pro graphics and Intel Core M with Intel HD Graphics 5300). You can download v3960 from THIS PAGE. The complete list of all extensions is available in THIS ENTRY of the GPU database. Looks like they could support all 4.4 extensions just in time for the 5.0 release. And AMD might by then release their 4.5 OpenGL driver. Main reason I buy Nvidia. Do they even have products that can compete head on? AMD have their APUs, Nvidia position itself above iGPUs. It seam that Linux driver have more 4.3/4/5 extensions implemented then windows one 🙂 and full OpenGL 3.3 on sandy bridge. That should be interesting really soon. May be it’s just me, but the MCAA still does not work with OpenGL. Not in any of my old games, at least. Only now there’s image corruption in some scenes — parts of the screen get besprinkled with pixel dust 🙁 My first thought was on overclocking, but nay, it happens even on stock frequencies and only in select scenes. Never with a D3D renderer, though. Intel 10.18.10.3958 WHQL drivers for Ivy Bridge only. 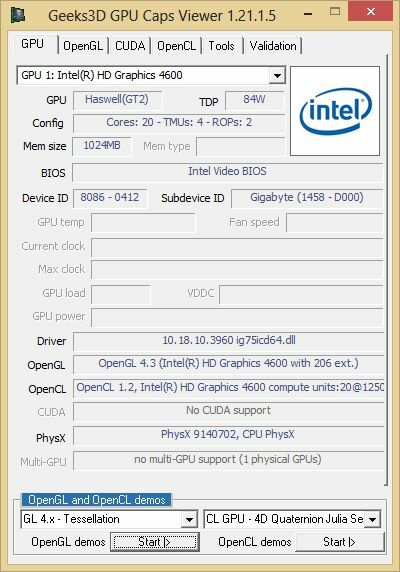 Intel 10.18.10.4080 driver for Haswell & Broadwell with new OpenGL & OpenCL extensions.